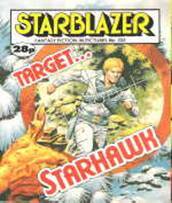 In the late 80's,Starhawk had three issues of the Starblazer pocket book series all to himself!One every year in 1986,1987 and 1988.Just where will he turn up next?Below is the complete run. My thanks go to Jeremy Briggs from Down The Tubes(see Links) for this additional information.Starblazer was a pocket book series similiar to the old Commando style books and ran from 1978 to early 1991.The issues usually featured either sci-fi or fantasy stories and were in 64 page format all in black and white with the front and back glossy pages in colour. Douglas Nicol writing in the Guestbook informs me that "Regarding the Starblazers, they weren't issued weekly. They were monthly. For the first three issues they were one issue a month, thereafter they were two issues a month. For some reason they never quite caught on as well as the Commando comics by the same publisher and can be hard to get hold of." More detailed and updated(hopefully)info on Starblazer can be found by clicking on the link below! stands for law and order-Sol Rynn known as Starhawk. When Starhawk was summoned to help,he couldn't have imagined what was in store. And this world existed inside a vast starship! where the price of failure is death.